Chocolate Chocolate and More! 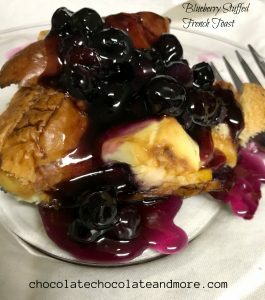 Blueberry Stuffed French Toast - Chocolate Chocolate and More! This recipe takes a little longer than your usual french toast, but it is sooooo worth it! Arrange half the stale bread cubes in the dish, and top with cream cheese cubes. Sprinkle 1 cup blueberries over the cream cheese, and top with remaining bread cubes. In a large bowl, whisk the eggs, milk, vanilla extract, and syrup until combined. Pour over the bread cubes and blueberries in the baking dish. Approximately 30 minutes before you are ready to bake, remove the bread cube mixture from the refrigerator and allow to "un-cool". Cover the baking dish with foil and bake 30 minutes. After 30 minutes, uncover the dish and continue baking 25 to 30 minutes, until center is firm and surface is lightly browned. Remove from oven and allow to cool 5 minutes before cutting to serve. Approximately 20 minutes before removing the French Toast from the oven, begin making the blueberry topping. In a medium saucepan over medium-high heat, mix the sugar, cornstarch, and water. Bring to a boil and cook 3 to 4 minutes, stirring constantly. Simmer 10 minutes, until the blueberries burst. You can stir in butter just before pouring over the finished French Toast, however I didn't add it to mine. Pour over finished French Toast, or provide on the side and allow each person to pour as much as they want over their serving.